A mother and her four-year-old daughter were detained for three days in Dubai for drinking a glass of wine on a flight from London, according to rights group Detained in Dubai. Ellie Holman, 44, was arrested at Dubai International Airport after being asked if she had consumed alcohol on the trip to the Emirates on 13 July. The Swedish national who lives in Kent, England, had accepted a complimentary glass of wine served with her meal on the Emirates Airlines flight to Dubai. Upon being detained, she and her daughter were held in a “baking hot and foul smelling” airport detention centre and not allowed to call her husband. Speaking to the MailOnline, Holman said: “So far this situation has cost me around £30,000 in legal fees, expenses and missed work. All our savings have gone.”She was released on bail and told her passport would remain confiscated until the case was concluded.’My passport remains confiscated until the case is settled, which I have been told will take at least a year,’ she said. Holman said her daughter was inconsolable when they were arrested and she tried to comfort her by reading her books in the jail.“My little girl had to go to the toilet on the cell floor. I have never heard her cry in the same way as she did in that cell,” she said. 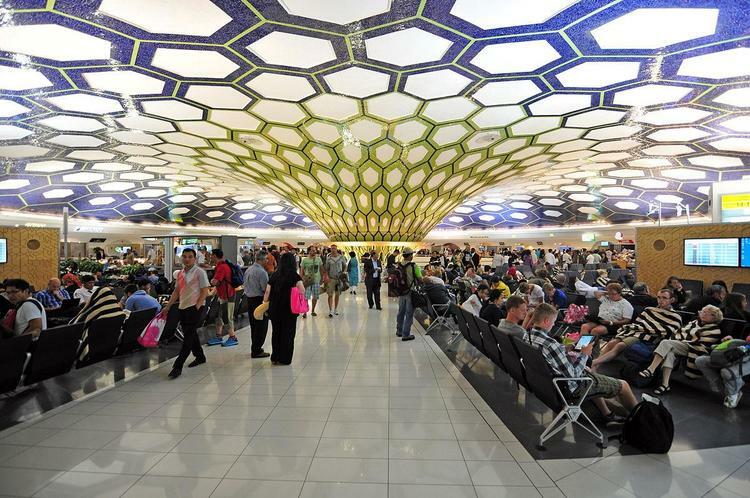 Featured Photo: People can be seen waiting for their flights in Abu Dhabi, UAE [Ralf Roletschek/Wikipedia].